How Much Is a Pinch of Saffron? Saffron – or as it's known in Arabic – is an essential spice in Moroccan kitchens, where it adds color and flavor to a number of tagines and dishes. It's important to note that saffron is regarded as the world's most expensive spice by weight, and no wonder – it's labor-intensive to harvest and hand-pick the saffron, which is actually the stigmas of the Crocus sativus flower. Taliouine, Morocco is famous for its saffron. It's from this region that most Moroccan saffron is grown. Saffron is famously expensive, and prices in large supermarkets tend to be especially high. 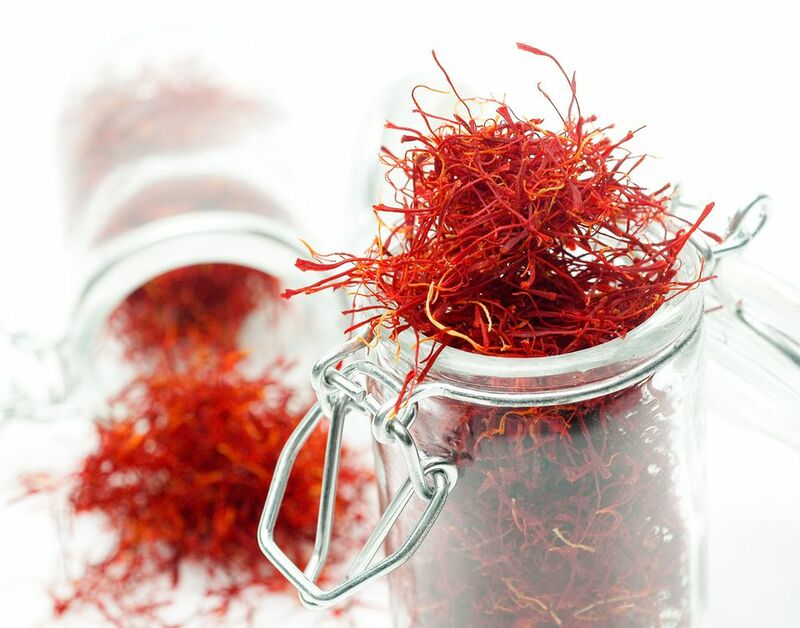 Instead, you'll probably find saffron to be more affordable in halal or Middle Eastern markets. When buying saffron, choose the thread-form over ground whenever possible, as ground saffron has a shorter shelf life than the dried threads. Select a high-quality brand, or if purchasing in loose form in Morocco, buy from a reputable spice vendor. Beware of bogus look-alike ingredients which may be mixed with the threads. Store saffron in a tightly sealed container – a small glass jar works perfectly – in a cool, dark place for up to six months. In actuality, saffron will keep for much longer, but it will gradually lose its flavor. A good place for saffron and other spices is in a drawer that's within easy reach of the stove. If the saffron stigmas are compressed together, it helps to loosen and separate them a bit before transferring them to the jar. That way, it will be easy to pull or shake out a few threads at a time. Saffron is famous for "a little goes a long way." As such, many recipes call for "a pinch" of saffron threads or "several" saffron threads. For mildly seasoned dishes, this is usually enough. In some Moroccan dishes, though, saffron is competing against more pungent seasoning, so it's not uncommon to find more generous quantities being used. In that case, loosely pack the threads in a measuring spoon to determine the quantity. Note: One teaspoon of saffron threads is equivalent to approximately 1/8 teaspoon ground saffron. Briefly soak the saffron threads in hot water or liquid before adding them to the dish. Briefly dry the threads in a warm skillet, then crush the threads to a powder with the back of a spoon. Cookbook author and Moroccan food expert Paula Wolfert uses a technique worth sharing here: she makes saffron water by soaking 1 teaspoon saffron threads, dried and crushed as described above, in 2 cups of hot water. When the water cools, pour it into ice cube trays and freeze. Transfer the frozen cubes to a freezer bag, and use one saffron ice cube for each pinch of saffron threads desired.